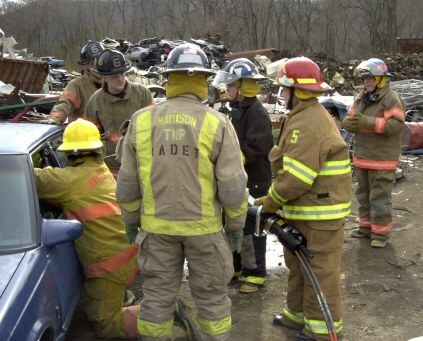 On 2/24/02 Clifty Six held an extrication class for some local EMT-B students. 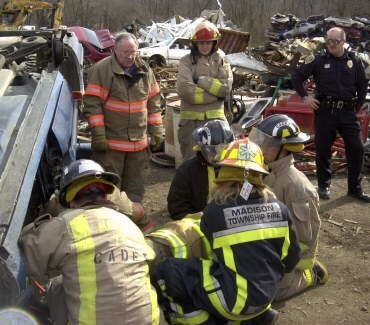 After an informal classroom session on safety and general terms used in extrication, the EMT students who needed turnout gear were loaned some of Explorer Post 706 gear and the class proceeded to the training site, a local junkyard. Here are some photos of that event. Clifty Six training officer Hendrick discusses the hands on session with students. "Olds Delta 88 for sale needs work." 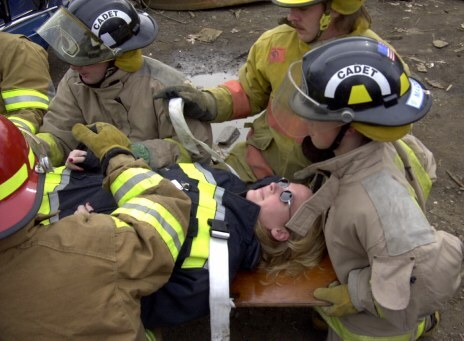 Says J. Royce, EMT student, prior to playing the role of the victim in the first scenario. 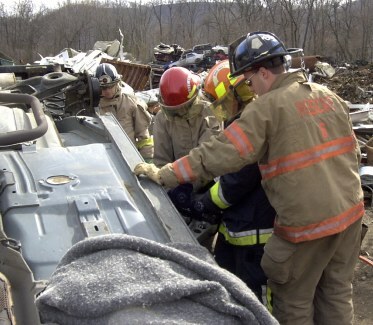 Clifty Six President, J. Bullock acts as Safety Officer as the first pair of EMT students try their hand at extrication. The first taste of "Tool Time." Asst. 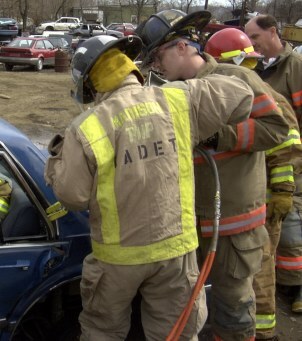 Chief McKay guides the EMT student in the use of the Hurst tool. Asst. 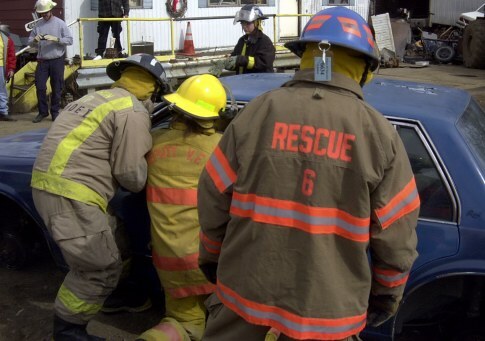 Chief McKay instructs as Training Officer Hendrick watches from another angle ensuring the Hurst tool doesn't come in contact with the victim. 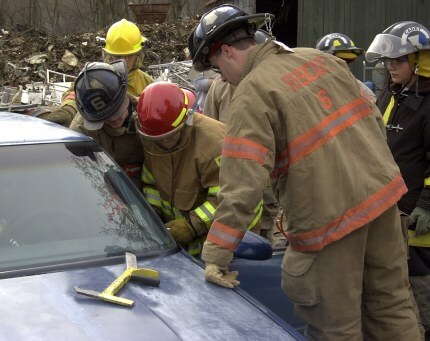 An EMT student maintains the victim's C-spine as the door is cut away from the car. Preparing to slide the victim on the backboard. Explorer Macon has the head of the board. The victim is freed from the car and what stylish sunglasses she has! Same car different situation and victims. 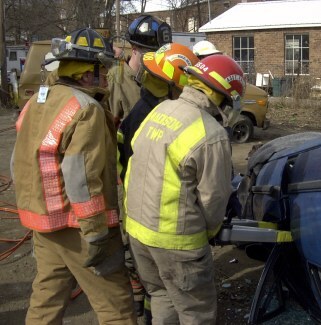 After disentangling the victim with his leg through the windshield, the students work to free the trapped driver. 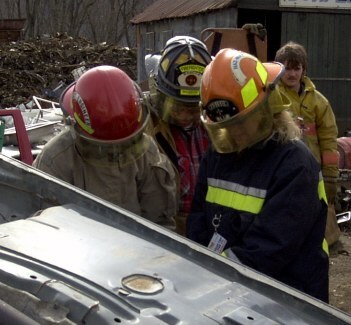 Clifty Six Firefighter T. Wolfschlag guides the students use of the "Big Jaws" Hurst tool. (Note the victim who had his leg through the windshield now standing in the background). 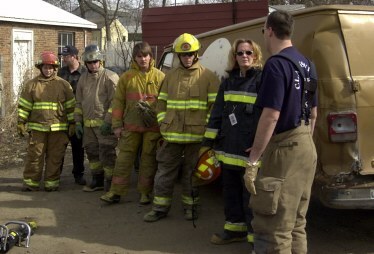 Another angle of the students working to open the door. The second victim is finally disentangled and brought out onto the backboard. 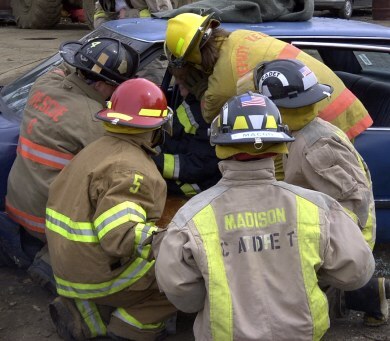 Unfortunately we have no photos of the third extrication situation we gave the EMT students as it was an "all-hands" drill. Everyone was too busy to take any pictures. 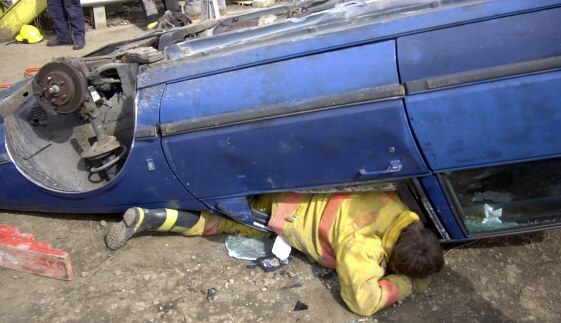 It involved a van with two occupants and they were trapped under the contents of the van. The "driver" had a head injury and was very unhappy. It was a good afternoon of work for all those involved.